There are some jobs in this world that we just hate and it would be fair to say that cleaning your cat’s litter box certainly falls into this category. It’s one of the most disgusting jobs out there although to preserve the health of your kitty, and to maintain just basic hygiene, it’s something that has to be done. Quite alarmingly, a lot of cat owners don’t do this frequently enough though. 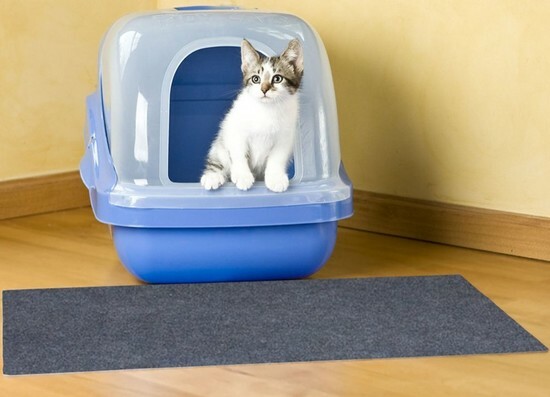 Your litter box should be maintained in two ways. On a day-to-day basis the feces and urine clumps should be removed, while you should clean the actual box from top to bottom every week. Failure to do this can leave your cat with all sorts of nasty health complaints – so get to work pronto! 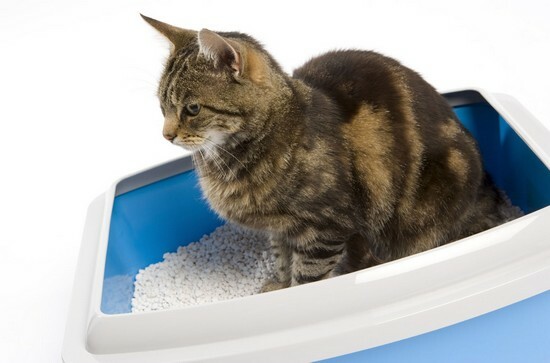 Can your cat’s litter box be harmful to your own health? Unfortunately, we’re going to have to answer this question with a resounding yes. 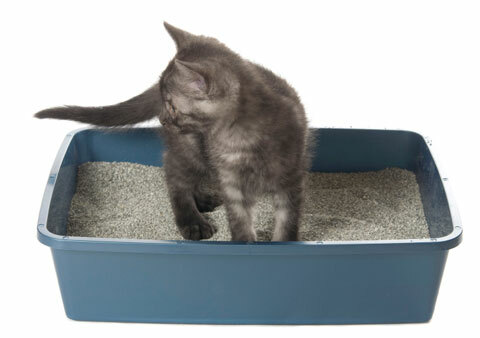 As you might expect, litter boxes aren’t full of healthy bacteria and they can cause several nasty health complaints. Toxoplasmosis is one of these issues and as this virus can be contracted through the feces itself, experts always recommend that you wear a mask whenever dealing with the litter box. Elsewhere, it should hopefully go without saying that rubber gloves are an essential item as well. Is there anyone who shouldn’t clean their litter box? On the subject of preserving your own health, we should point out that any pregnant woman should not entertain cat little cleaning duties. This is for the exact same toxoplasmosis reason that we noted in the previous section. While toxoplasmosis is nasty at the best of times, in pregnant women the risks intensify. It can be passed to your unborn baby, while it has also been linked to miscarriages. 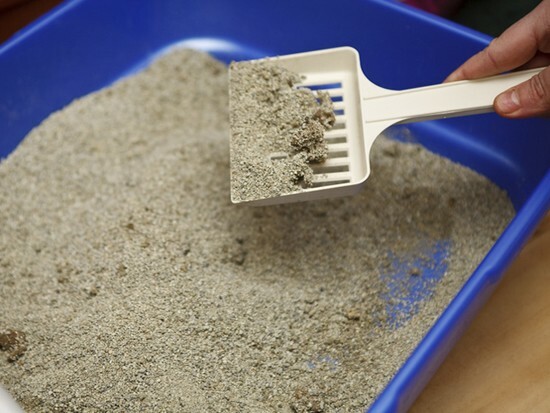 What’s the proper process for cleaning your cat’s litter box? 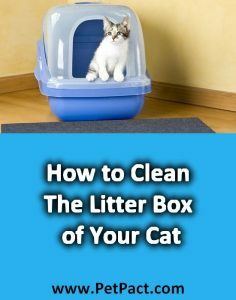 Following on from the above, now let’s take a look at the process that you should be following as you look to effectively clean your cat’s litter box. As we noted previously, cleaning can be separated into two stages. The daily version is actually very basic and simply involves you scooping feces or urine clumps out of the box and discarding them. The more thorough weekly clean is much more complex. You will firstly have to throw away the old litter. If you are one of the lucky cat owners who uses a liner, this is relatively straightforward and you can simply pull out the liner and place the contents in the trash can (armed with your rubber gloves, of course). Unfortunately, not everyone’s cat accepts these liners and on these occasions you will simply have to pour the entire box into a trash bag. A lot of the time, the box will be left with dried litter so it’s here where you’ll need to scrape it out and into the bin. Regardless of whether or not your litter box uses a liner, always make sure you are wearing a mask at this point. This is because the litter can prompt dust to fly everywhere and as you may have gathered, all of those nasty parasites are contained in this. Additionally, restrain from discarding the litter in the house – always try and take it outdoors where you are going to have very little contact with it. Unfortunately, the chores aren’t over just yet. You will now have to clean the box itself. Once again, we’re going to reiterate the fact that you have to wear gloves, as you wash the box with soap, warm water and a sponge. Add a mild detergent for added effect, although refrain from using harsh cleaning chemicals as these can be harmful to your pet. It should go without saying that you’ll need to scrub until the box is shiny and clean. We will again advise that this is carried out outside, to prevent germs from spreading inside your house. To complete the task, add your new liner or fill your box with a couple of inches of new litter. Is there any way to simplify the cleaning process? Up until recently, the answer to this would have been a definite no. 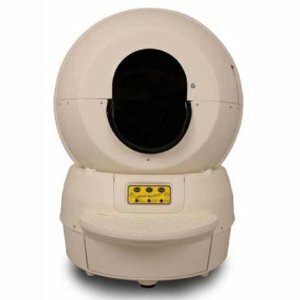 However, we have come across products which are able to make the life of the cat owner much simpler, with Litter Robot falling into this category. 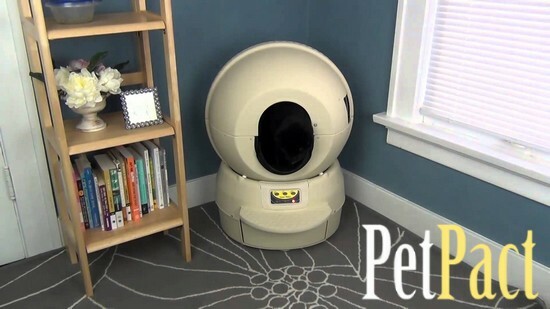 Litter Robot is a self-cleaning litter box – you no longer have to do the scooping yourself. It will automatically clean itself each and every occasion your cat uses it, saving you huge amounts of time and meaning that you no longer have to carry out the unpleasant job. 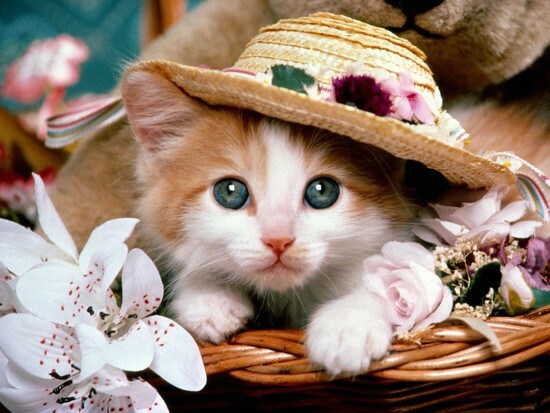 Not only will this make your life better, your cat will be thankful for it as well. It’s a well-known fact that cats simply love clean litter boxes and as Litter Robot cleans itself after every occasion, your cat will always be using a clean litter. You don’t have to purchase any special clumping litter here; Litter Robot has been designed to work with anything. Gone are the days of your cat’s litter posing that unpleasant odor that we’re all familiar with. 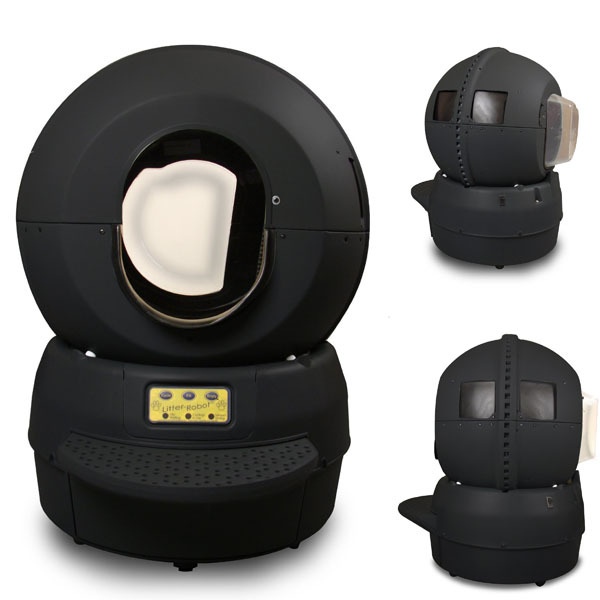 Litter Robot is designed to prevent mold growth and can therefore eliminate such odors. As well as being cleaner and easier to use, there’s also the issue of saving money. You no longer have to constantly have to fork out for special receptacles or bags; past customers have suggested that they now only use half the amount of litter as they did when using a traditional system. On the subject of money, the system arrives with a generous 90-day money-back guarantee. In other words, your pocket is protected. The manufacturers of this product are fantastically regarded as well. The fact that they provide a full 18-month warranty says everything about their reputation and shows how they can be completely trusted. How does Litter Robot work? 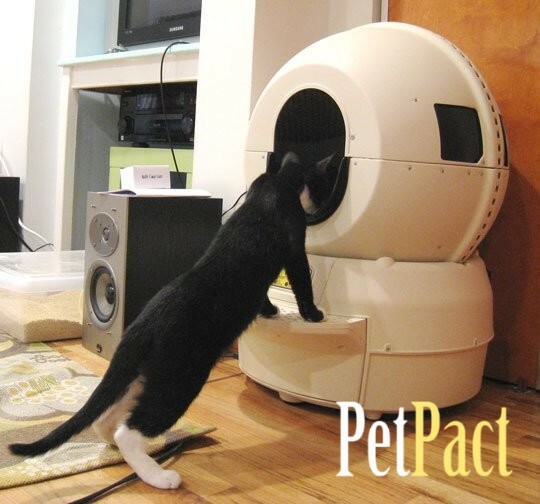 As you may have gathered from the name, Litter Robot is actually quite an advanced system. Your cat will step inside the globe where the litter is based, before proceeding to leave his urine or feces clumps. Once he leaves the globe, a system is activated which scoops up the clumps and discards them to a bowl situated underneath the main globe. After a few days, you can simply pull out this bowl and discard it in a bag. It’s a much simpler and cleaner way to deal with your cat’s litter and means that the days of daily and extensive weekly cleans are long gone. What does Litter Robot cost? Unsurprisingly, the Litter Robot is aimed at those cat owners who want to make a significant difference to their own and cat’s life. For this reason, it is a premium product, with the $369 price tag reflecting this. However, it is possible to purchase reconditioned units for as low as $309, while the manufacturers also offer a 3 payment plan option. More extensive pricing information is available on the product’s official website, at litter-robot.com.